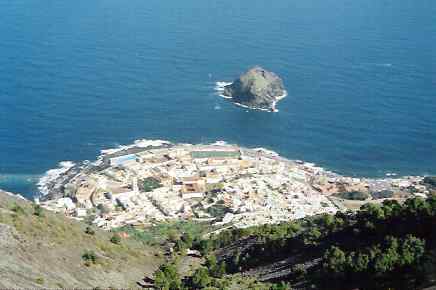 Puerto de la Cruz is a charming place and is most pleasantly green. In Part 2 of his travels in Tenerife, Ed returns to tells us of the majesty of Teide, the magic of Maska and the mayhem of Puerto de la Cruz. Did you notice that I moaned about the rain in Puerto de la Cruz in Part 1? Well, in all fairness, I guess that gives me the right to now moan about the heat and humidity in Part 2. During this trip it only rained two nights in a fortnight. How refreshing to have weather as variable as England. But in England, black clouds signify rain. Here this does not often apply; they appear to have things organized here so it rains only at night and not during the day. Which, it has to be said, is one of the few things that is organized around here. They recently built a new sewage disposal system, for example, but forgot to connect it up to anything. You know how these things happen. Planning is a bore and you can always do it tomorrow. Pity though, because it now means digging up all the roads after most of them had just been given a nice new surface. Come to think of it, there are an awful lot of similarities between here and England - except for the weather. They get what they call 'African Weather' here, when sand blows in from the African Sahara and the sun blazes down even in the north of the island and the temperature rises significantly for a few days. I just revisited the island to stay at Puerto again, and over two weeks, the first was extremely hot and humid (upper thirties centigrade) while the following week was mid-twenties to mid thirties. Of course, such is the freaky nature of the weather on this planet these days that nothing is particularly predictable - anywhere. Everyone said this was hotter than usual for early September. Although I staid at an historic old hotel with splendid palm court, it had one disadvantage: just fans, not air-conditioning. This scheme was not particularly conducive to sleeping at night. But that's another story that I shall not let slip. Let's get back to that all important topic, the weather, for a moment - and the two climates of the island. Most of the Canaries suffer from the humid-north and dry-south syndrome. What happens in Tenerife is that each night the clouds (via trade winds) come in from the north and, if they are heavy with moisture, they bump into the mountain, being too heavy to ascend and pass over. These heavy clouds then gradually release their water into the waiting Canary pine trees, with each little needle extracting its own share of droplets which they then drip onto the ground to be soaked up in subterranean levels and filtered by Nature to be delivered by water courses for use as water on the island. Once they are light enough the clouds can make their fluffy ascent and then pass over the mountain. It's a great little scheme, although they have to supplement it in the south by desalination plants working on sea water to cope with all those visitors who seem to expect and endless supply. In the north you can feel the increased humidity brought on by the presence of clouds; in the south you can feel the dryer heat. 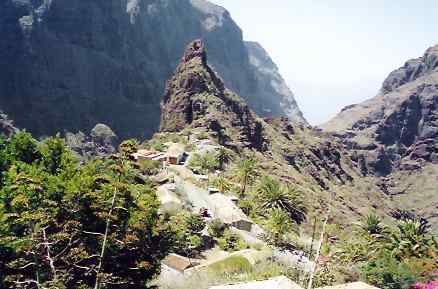 The division between these two climates brings about a sudden divide with respect to the vegetation, and the picture above shows this on the ridge of a mountain with vegetation on the northern side seen as a sharp contrast to the arid southern side. Of course, what goes in must go out, if you get my drift, so I was a little bit suspicious about the murky line on the sea just out from the bathing beach in Puerto which never seemed to disperse. (Did I tell you they were working on the sewage system?) Now I'm not saying anything in particular - other than I preferred the look of the albeit small hotel pool. Now, back to sleeping at night - or not. Where we stayed up on the hill the last time H and I visited Puerto, it was out of town and fairly quiet. I slept at night. But it was a long walk into town and a terrible climb back. This time we were downtown, right in the hub - and that amounted to hubbub. Whilst it may seem a sensible scheme to have a siesta for three or four hours from noon in a place that can get as hot as this, there can be a drawback for those not used to it. Because everyone wakes up at 4 pm and takes on a new lease of life, many are still going strong at 2 am the following morning. And when I say strong, what I really mean is LOUD. There seems to be something about the Spanish way of communicating that requires LOUD. Just across from the hotel was what, in English, translates as 'Europe Square' (Plaza de Europa), bordering on the sea. A couple of wide, open paved areas next to the police station proved ideal for the island lads and their skateboards. Slap, slap, slap... the endless sound, not of the waves, but of the lads trying to jump-turn their skateboards. They seem to spend their life trying to achieve this but, clearly, theylearn slowly. And so it goes on, and on, and on. Slap, slap, slap. Even late at night. Then there is the regular, informal football practice in this square when other lads (and lassies) really get enthusiastic. In fact, so enthusiastic are they that they sometimes turn up in the early hours of the morning in loud cars to begin an enthusiastic - and LOUD - game. Then there was the night the square resounded to the sound of what I can only describe as 'massed drums rehearsal'. It had to be a rehearsal - surely - because it did seem to improve in a qualitative sort of way as it went on. But that was the trouble, it went on and on, and on - and quantitatively it just grew and grew. Were more and more drummers being drafted in as the night progressed or did they just work themselves up into a frenzy? Make no mistake, we're talking big bass drums here, not bongos. And when they got it right they just couldn't stop themselves. What enthusiasm. Suddenly it would stop, a couple of people would clap - we almost joined it at the thought of peace at last - and then... you guessed, it, it started over again. Just millions of drums and someone blowing a whistle like a loose cannon. (Could it have been a lone policeman harassing them on our behalf?) Three hours, my friends. Three hours of throbbing temples. Then, after finally getting to sleep that hot and humid night, a loudspeaker in a car started up in the square in fierce German in what sounded like a Nazi rally at half-past three in the morning. Half-past three! What is it with these people? I think they should ban siestas if this is what it does to their body clocks. I tried afternoon siestas to counter the effects of poor sleep at night. The result? Couldn't sleep at night. Having mentioned a few of the downsides of staying downtown, it is only fair to mention a few upsides. 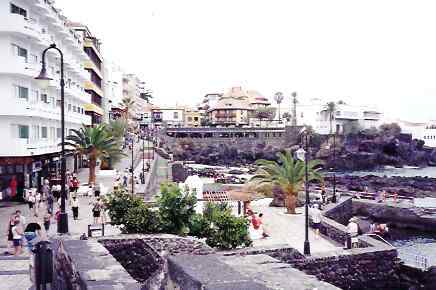 Puerto de la Cruz is a charming place and is most pleasantly green. it is a great pleasure to sit at a café table in El Charco Square (Plaza de Charco) and watch the world go by. As someone said to me, "People come out here and expect things yesterday for a couple of years, but then they realize tomorrow will do. Or the day after." And that goes for service at some of the restaurants and cafés but hey, that's what you're paying to do: relax. So just RELAX. You'll also wait to pay... unless you abandon the table with funds. But that's what it's all about: RELAXING. There's always all night to do other stuff, right? Yep, it was great to be able to just turn out of the hotel right into the heart of this throbbing little town. The northern part of the island might be more humid, but the rain associated with that does mean it is beautifully green. The picture to the left is from my hotel roof and is of what is known locally as 'Old Ladies Square'. It shows the bonus of this: beauty within the town. This square is one of many beautiful places to sit, and there are many shady palms to give you shade outside the church; hence the appeal, I imagine, for old ladies (and gentlemen). You can reach this square by following the main drag (Calle Quintana) from Plaza de Charco. And the angels/fairies come out at night in Puerto... on their pedestals, ever ready to give you a wave, smile or twirl at the drop of a coin. Goodness knows how it pays their time. H had a weak spot for the bronze statue with the hat who was always ready to give it a twirl for a coin in his tin. It was his cheeky little smile that won her heart. Puerto has a promenade (Calle San Telmo) that leads towards Avenida Colón and the Lago Martiánez complex of pools that allows anyone to wallow in pools surrounded by vegetation or worship the sun on beds aplenty. The promenade is always busy but it comes alive at night with families, couples, break-dancers, African hawkers and hair twirlers plus, of course, tourists. There's so little beach here that people drape themselves along the rocky walls, girls preen, men are seen, many are lean. At the other end of town there is the garden beach (Playa Jardin) where surfers try to surf (I told you they were slow learners here) and hang-glider operatives soar down to a landing having leapt earlier off the mountain that is Teide. The sand, though, is black; but that's what you get from volcanoes, funnily enough. There is space to spread a towel here, grab a (shabby) sunbed or even eat at a beach side café. 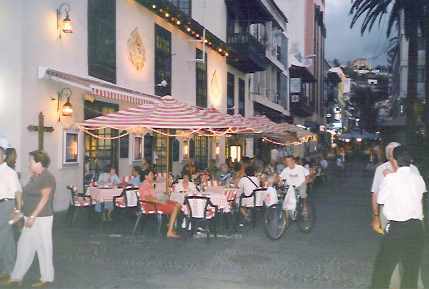 While in Tenerife in one of your more relaxed moments, you might like to try the local drink, a lumumba; unlike the usual cocktail of this name, their lumumba is hot chocolate with brandy (1 oz). Personally I like hot chocolate and I like brandy, but I think it a shame they have been introduced; I feel it spoils the uniqueness of both. But that's just me. What do I know of such sophistication? 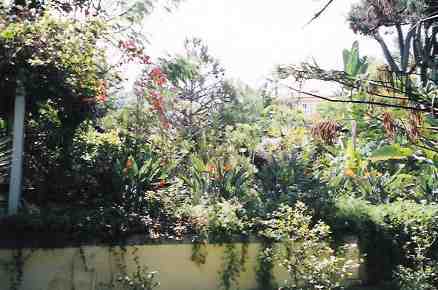 Hidden up the hill behind Puerto lies the orchid garden (Jardín de Orquídeas) created by - and subsequently maintained by - Englishmen! 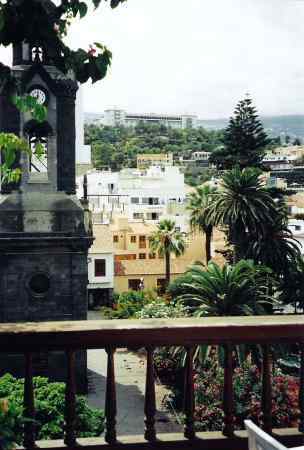 It is reputed to be the oldest garden in Tenerife. One thing is certain, no matter how many times I go back to Puerto, I shall always revisit this garden. Even if you do not particularly like orchids, still visit it, for it is the most beautiful and tranquil garden you could ever wish wish to find. (This most beautiful spot is truly worth trying to find! It is tucked away up a narrow and steep little road not far from the big tower block seen from everywhere and known as Bel-Air. From the shopping centre off the palmy road known as Calle Aguilar y Queseda, turn your back on the sea and head for the Bel-Air block bearing right of the big storm drain shown on the map as Barranco Martianez, walking along Calle de Valois. Look for the 'Orchid Gardens' sign pointing up the steep hill of Camino el Robado to your left, just beyond a little garden - where you might wish to sit and conserve your strengh for the climb that is to come.) When you do find the Orchid Garden you will be amply rewarded. It is not large but it is charming and beautiful. It contains many separate 'rooms' including water features, a croquet lawn and the all important orchid walk. There is also a splendid garden tea room where you can get a genuine cup of English tea! It was even served by an English girl. This is a garden with history, and I will mainly leave it to reveal this to you itself - other than to say it was originally a convent with the mansion being built in 1730. It was purchased in 1774 by Archibald Little, a British merchant, whose family owned it until 1854, when it was then purchased by another Englishman, Charles Smith whose family then owned it right up until 1996. It opens daily 0930 - 1430 hrs. 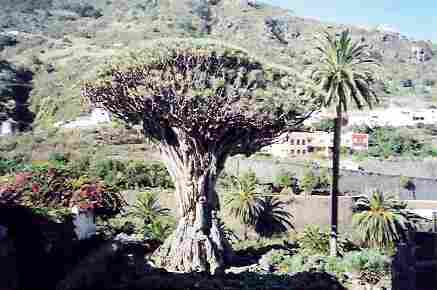 Setting out west from Puerto de la Cruz it is inevitable that a tour with take in Icon de Los Vinos to see the great Dragon Tree. (I mentioned it in Part 1.) But I learned even more about these fascinating trees from the splendid guide on my second visit. I said before that this particular Dragon Tree was reputed to be at least 1,000 years old; some same 3,000 but, whatever, it is said to be the oldest Dragon Tree in the world. I can now, reveal, however, why there is such a large discrepancy between these estimates: they are purely guesses! No one really knows how old this tree is - or any dragon tree. Unlike conventional trees that show a ring-per-year of growth, the dragon trees do not. And because of their habit of letting down aerial roots all around them, the trunk of really old trees such as this become totally obscured by these roots and the original trunk actually rots away to leave a hollow middle. This has happened to this old giant, and it was in some danger due to the poor condition of its rotting trunk until the local tree-doctor decided firm action was required to get to the root of the problem. They cut a little door at the base of the tree and went inside to clear out the rotten wood. Then they inserted a ventilator to help it breath and keep in pristine condition. Upon close inspection you will see the power lead for this even now. So this is possibly the only tree that has had intensive care and remains on a life support system. But it looks very healthy now. Well done that tree doctor. 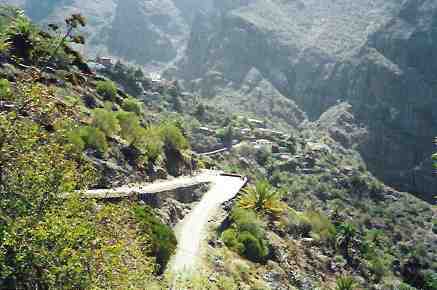 Maska is an isolated mountain village that, until recent years, could only be reached by donkey. You might ask why anyone would want to live in a place so difficult to reach. The answer is because it was such a difficult place to reach. No, this is not the hideaway of celebrities, it was originally a pirate village. Land the contraband on this coastline and you were free to take it by donkey without any prying eyes whenever you saw fit. And you needed to be fit to live there. Today there is the mountain road, fairly straightforward from nearby Garachico in the east, fairly 'bendy' and hari-raising from the west: the preferred entry for tour buses. Once there you can walk down the cobbled lane to a great little café and enjoy a tremendous view and that mountain silence that is so rewarding to the ears. I tried their cactus drink: a dry, red liquid that tasted a little like cranberry juice. This is, perhaps, one of the most tranquil - and green - spots on the island. It's well worth a visit although, I must warn you, the tours don't stop there for long. This is probably because there is no proper parking and a long string of buses would not improve the tranquility. The other option is to stay in a holiday cottage there! This would, of course, necessitate navigating this road whenever you went anywhere else - apart from the many walks you can do right there. The walks would have a tendency to go up and down rather a lot, I suspect, and the drives the tendency to require edging past tour buses from time to time, but apart from that, this does offer up a unique alternative to conventional hotel board for the more adventurous - and active! The real end came for the harbour town of Garachico in 1706 when the town was destroyed by the worst recorded volcanic eruption on the island. Most of what is to be seen today had been rebuilt above the ruins of the old town, although the Castillo de San Miguel still survives. The picture looking down on the town from high above on the mountains is a shot taken between the two lava flows that embraced the town in its fiery grip. The fall of Garachico meant that many people decided to emigrate to America but this was not because they wanted to leave - simply because there was no work left for them on the island. A statue in the town depicts the spirit of this as a man leaving with suitcases... but sadly with a hole in his heart. The drive up from Puerto de la Cruz through the Oratava Valley and then up through the clouds to the Teide National Park should be compulsory for all visitors. Several tour companies offer this trip - or you could hire a car. This shot, just above the cloud cover, was the place from which hang-gliders take off to soar down to the coast at Puerto. 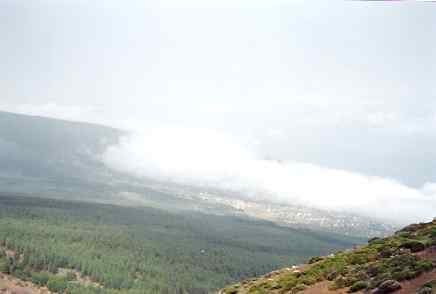 The climb up to here is through the Canarian Pines that capture the moisture from the clouds, as explained earlier. The pine cones of these pines, incidentally, are like little bendy snakes of interwoven threads, not at all like the conical cones usually associated with pines. The pines on these mountains are also different in another important way. They have a tough inner core that survives fire and quickly regrows after any forest fires. The forest is beautiful in itself and a huge contrast to the barren south side of the island. En-route to the national park you pass what is known as St. David's Cake. This is a fascinating example of strata that serves as an aperitif as to what is to come once you reach the national park proper: a cross between a lunar and a Martian landscape! 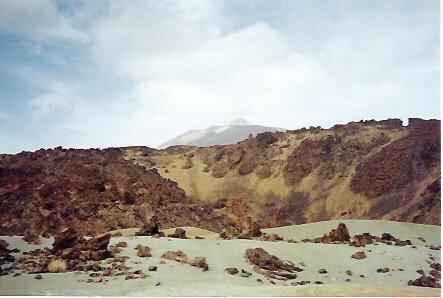 The left-hand shot shows the distant peak of Teide taken from within the Teide National Park. Much of the year it is in snow. The right-hand shot gives you an impression of the varied landscape within the park area. What you need to understand is that the Teide National Park is itself located within the caldera of a much larger original volcano. Over many thousands of years this formed the largest crater in Europe. 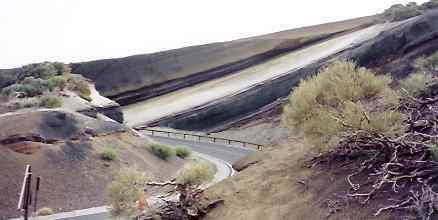 In round numbers, this is at an approximate altitude of 6,000 ft, and the current highest point of the present volcanic cone (Pico del Teide) rises from within this huge area to around 12,000 ft. The original volcano fell within itself, right down to its magma chamber, some 24,000 ft below, and the outer rim of this formed the 75 km volcanic rim that defines the caldera; this was the huge original volcano in which you can now stand! In the right-hand picture you can see the distant rim of the original volcano. This picture serves to show you how green it is up here in places, and this helps explain how it was that I thought I glimpsed a wild dog when we were passing up through the forest. Later on I saw another emaciated dog with a chain collar (minus tag). I tried to tempt it with a piece of my lunch but it sniffed and was not interested, despite the fact it was a starving bag of bones. I took its picture but I spare you that. Further enquiries established they hunt on the mountain and that some dogs do get lost. This was one of those dogs. I hope it did not suffer too long in the heat of that arid mountain where, at the exposed level it had reached, there can be hardly any life. It is possible to ascend to the summit of the Teide by cable car. Indeed, the leaflet of Teleférico del Teide tells you that, thanks to its cableway, 'the peak is accessible in only a few minutes'; what it doesn't tell you is that you could queue for hours to get onto their cableway; 2-3 hours is not uncommon! That's why most tours no longer offer this as part of the deal. And given the fact that there is only one service bus early in the morning that goes there from Puerto, and another one back in the later afternoon, the bus is not a practical solution either. So if you really want to do this it's either a car or an (expensive) taxi you'll be needing. I settled for the national park and for looking up at the peak. I hear you only get eight minutes up there anyway. 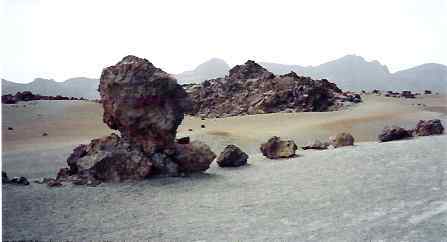 Teide is very different to the black mountain that is the typical volcanic landscape of Lanzarote, for example. 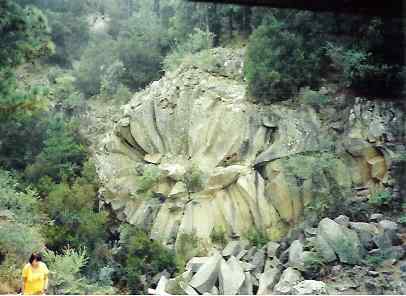 The National Park will surprise you with the colour within the rocks, not to mention the scattered vegetation. Get your timing right and you can even see flowers blooming up here. Teide is an island of contrasts and delights. If you do no more than stay in the southern tourist resorts of Playa las Américas or Los Cristianos you miss a great deal. Yet that is what the average tourist does. Let me urge you to spare some hours from your risky sun worship and tempt you to visit the green north, the mountainous Teide and the enchantment of Maska. If you've been to Tenerife and never discovered these, then you have done the island a great injustice, and you have only seen the parched edge of this richly contrasting island. Be bold! If you enjoyed reading the above article then you will probably also enjoy Tunisia by Ed, and Malta, also in Europe, and our latest articles covering the Orinoco Delta, La Mata, Marbella and Beijing.